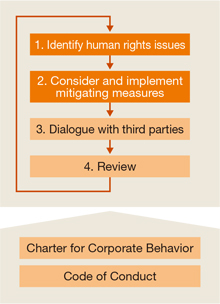 The Fujifilm Group believes that respect for basic human rights is an aspect of our compliance and we have stated our commitment to it in the “Fujifilm Group's Charter for Corporate Behavior and Code of Conduct.” We hold regular training programs aimed at engendering respect for human rights and eliminating discrimination. We also have included items on human rights issues in our annual self assessment questionnaire for the business activities of our Japanese and overseas affiliates. Additionally, in the dialogues with our business partners, we had some advice and some awareness to promote our CSR activities further, we are working on improvements with relevant organizations, while defining priorities. At the same time, we are strengthening CSR procurement activities in the face of the demand for greater respect for human rights in the supply chain that we have seen in recent years in the form of the Modern Slavery Act in the UK and the California Transparency in Supply Chains Act in the US. In our efforts to promote due diligence for human rights in response to recommendations from external entities, FUJIFILM Holdings has been participating in the Japan CSR Consortium managed by Caux Round Table Japan since 2012. We are studying human rights risks and action for improvement within the industry and the company. 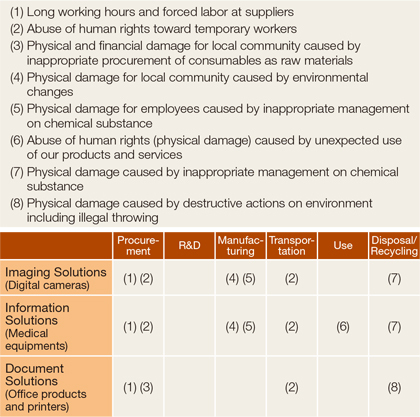 In view of the support for the United Nations Guiding Principles on Business and Human Rights expressed in association with “Sustainable Development Goals (SDGs)” and “responsible supply chains” in the Leaders' Declaration G7 Summit at Schlouss Elmau in June 2015, the FY2016 Consortium defined the priority issues in each industry based on the “Human Rights Issues by Sector (Fourth Edition)” (*) that had been under review and the SDGs agenda, while examining problems that have been presented by NGOs and NPOs. In the latest discussions, we recognized that the technological power that our industry possesses was confirmed to be able to contribute to the resolution of the various social issues mentioned in the SDGs, but at the same time presents great potential risk to the supply chain. Along with the recognition, we examined the potential risk in each of our business fields. At the international conference that the Consortium held, we held discussions and exchanged opinions with experts on the discussions at the Consortium, our status of consideration on our potential risks in our business, and Human Rights Policy that is under review within the Group. Through the dialogue, we received suggestions on activities to be implemented. In response to the findings, we plan to work on the assessment of potential risks in the supply chain of our organization and further promote CSR procurement activities in coordination with our business partners. 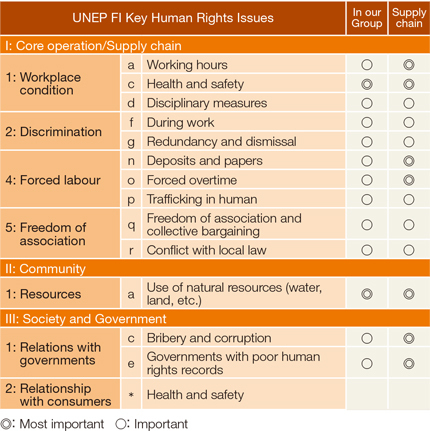 * Human Rights Issues by Sector (Fourth Edition): Created by the Consortium based on the Human Rights Guidance Tool of the United Nations Environment Programme Finance Initiative (UNEP-FI). To clarify our Group's stance, we aim to strengthen action, both internally and externally, through implementation of our Human Rights Policy, along with the Group's Charter for Corporate Behavior and Code of Conduct. We will continue to actively adopt outside opinions and joint studies with other companies and continue with our activities to raise awareness of the importance of human rights issues within the Group.